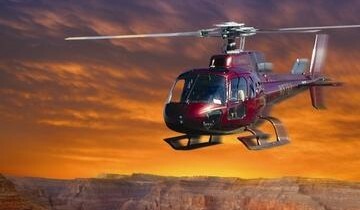 Your Grand Canyon helicopter adventure begins with a luxury helicopter flight over the Hoover Dam and Lake Mead. You will descend 4,000 feet to land on the floor of the canyon. After you land, you will embark on a pontoon boat ride for 12 – 15 minutes along the mighty Colorado River. You will then ascend via helicopter up to the West Rim of the Grand Canyon for a shuttle bus tour of the rim. You will have four hours to explore the rim on your own, including a chance to partake in a complimentary BBQ lunch served at Guano Point. Eagle Point – Here you will find the world famous Grand Canyon Skywalk. The Skywalk is a bridge with glass floors suspended 4,000 feet above the canyon offering spectacular views of the canyon and the river below. You can also tour authentic recreations of Native American dwellings at Eagle Point. (Skywalk admission is not included but can be purchased as an option when you check-in for your flight). Guano Point – A fantastic lookout point over the vast West Rim of the Grand Canyon. This is where Hualapai Indians prepare a daily BBQ lunch for guests at the West Rim (included with this package). Hualapai Ranch – Enjoy an authentic Grand Canyon western town experience, with photo opportunities, cowboys, and a trading post for souvenirs. Half-hour horseback rides are available for purchase. Once your time at Grand Canyon West has come to an end, you will board your helicopter for a flight back to Las Vegas which concludes with a fligh over the famous Las Vegas Strip!